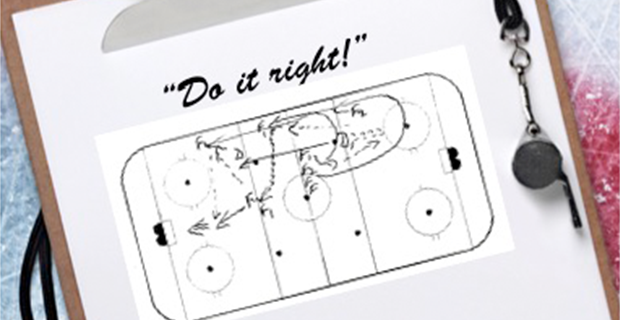 Deflections: Hockey Drills – Do this, Do that… Do it right! I wanted a drill for my junior guys to work on a couple of things at once, principally offensive timing. I found one in my archives and tweaked it a bit to suit our needs. Players have to do my drills as designed and described. They also have to do them at a speed I determine for both to happen. There’s a method to such madness, something players don’t necessarily see nor do I expect them to right away. Some kids need a second look, others need the assurance they’re going to go about it correctly. So I address the questions and for a handful I suggest they watch teammates for a bit instead. This particular drill required one forward to get a pass in the neutral zone at the boards from a defenceman while a linemate swings behind the defenceman and up the boards to trail. The defenceman will then jump up to join the attack from the rear. No, I’d explained to the group, this isn’t a new regroup. You’re going behind the d-man to create better timing to receive a back pass from the front guy so he can take back ice at the blueline and you, the second forward, can gain the offensive zone with speed. Otherwise, you’d be waiting and coasting. We began the drill, which looks simpler on ice than described here, and the first four pairs of players did it completely wrong. The second forward did NOT do as asked. So he ended up nearly standing still when he got the puck, which of course made his partner slow to a crawl and in turn, made the drill useless. I don’t know why those first players didn’t do as asked. When I stopped the group and brought them in, I resorted to my standard questioning technique meant to solicit a response I could fathom. I got no response. No one could explain why they took shortcuts and didn’t do the drill as laid out. And that’s when my brain’s fluorescent bulb flicked on and the arena got instantly brighter. The wrong kids went first. Worse, I hadn’t first demonstrated the drill or simply walked them through it. Teaching timing is awkward because it combines physical with mental training. Doing it fast from the get-go is invariably going to be a mess – as this was. Yet another coaching lesson learned about getting players to do drills correctly.